Habit: Annual; taprooted; sap milky. Stem: 1--3, 5--30 cm, erect or ascending, branched from near base; proximally glabrous, distally conspicuously dotted with tack-shaped glands. 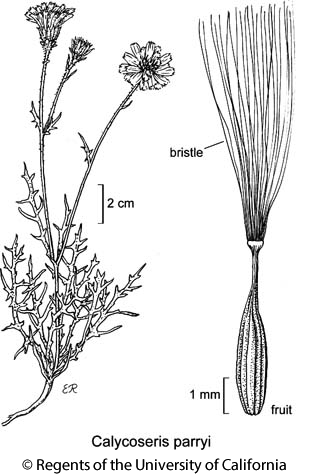 Leaf: alternate, sessile; basal blades pinnately lobed, lobes narrow, linear, spreading, ultimate margins entire, smooth; distal cauline reduced to linear bracts. Inflorescence: heads liguliflorous, 1 or in open, few-headed clusters, peduncles 1--3 cm; phyllaries in 2 series, outer unequal, < 1/2 × inner, reflexed, inner lance-linear, equal, scarious-margined, acute, reflexed in fruit; receptacle flat, smooth, each flower subtended by 1 fine, smooth bristle. Flower: many; ligules yellow or white, readily withering. Fruit: fusiform, body tapered to beak, ribs 5, separated by grooves, faces smooth or roughened; pappus of 50+ smooth, white, basally fused bristles, borne on finely toothed cup at beak tip, deciduous. Species In Genus: 2 species: southwestern United States, northwestern Mexico. Etymology: (Greek: alluding to shallow cup on fruit tip and to chicory) Note: Perhaps best placed in Malacothrix (Lee et al. 2003 Syst Bot 28:616--626). Leaf: basal 5--12 cm. Inflorescence: involucre 13--17 mm, inner phyllaries 10--13 mm. Flower: ligules 1.5--2.5 cm. Fruit: light brown or gray; ribs +- smooth; pappus 6--8 mm. Chromosomes: 2n=14. Citation for this treatment: L.D. Gottlieb 2012, Calycoseris parryi, in Jepson Flora Project (eds.) Jepson eFlora, http://ucjeps.berkeley.edu/eflora/eflora_display.php?tid=1891, accessed on April 19, 2019. Teh, e SCo, SnGb, e SnBr, PR, SNE, D; Markers link to CCH specimen records. Yellow markers indicate records that may provide evidence for eFlora range revision or may have georeferencing or identification issues. Purple markers indicate specimens collected from a garden, greenhouse, or other non-wild location.